How to create SBT project with IntelliJ Idea? 2) with Eclipse. So, I created a new Sbt project (with a little script I wrote, configuring the Sbt project to be a WebProject). I used then the sbt-eclipsify plugin to 'convert' the project for Eclipse, which I then imported in IntelliJ (existing source -> eclipse). But the problems started here: I cannot get the IntelliJ Sbt plugin to work. 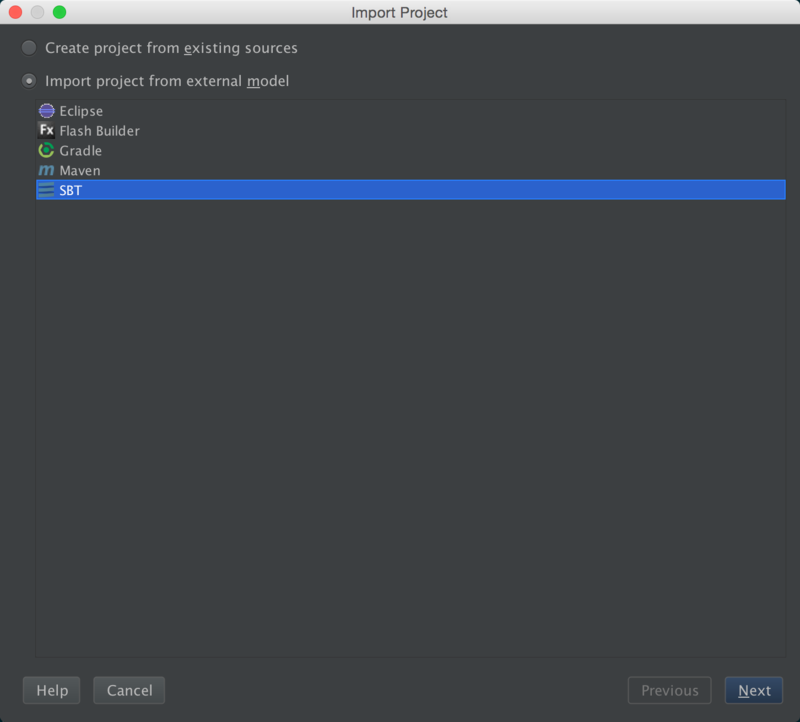 There are three basic ways how to create a project - modern versions of IntelliJ can import sbt project out of the box, otherwise you can either use sbt plugin to generate IntelliJ project, or use IntelliJ Scala plugin to create sbt project. Basic features work out of the box using both solutions, some complex builds can have problems, so try other tools to see if it works there. IntelliJ IDEA has become so much better these days. The current version (14.0.2) supports sbt projects out of the box with the Scala plugin. Just install the plugin and you should be able to open up Scala/sbt projects without any troubles. With the plugin, just point at a sbt project and IDEA is going to offer you a wizard to open that kind of project. 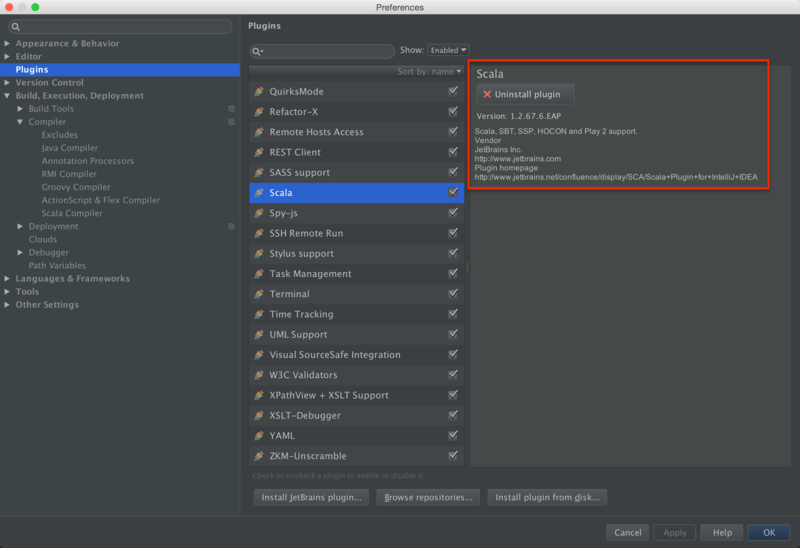 IntelliJ plugin can be found here http://confluence.jetbrains.com/display/SCA/Scala+Plugin+for+IntelliJ+IDEA or can be installed directoly from within the IDE using Settings -> Plugins dialog. Afterwards one can just do File -> New Project -> Scala -> SBT based. IntelliJ will generate basic build.sbt, download necessary dependencies and open project. Simply add addSbtPlugin("com.github.mpeltonen" % "sbt-idea" % "1.5.2") to your build.sbt; no additional resolvers are needed. resolvers += "sbt-idea-repo" at "http://mpeltonen.github.com/maven/"
Use gen-idea in sbt to create IDEA project files. By default, classifiers (i.e. sources and javadocs) of sbt and library dependencies are loaded if found and references added to IDEA project files. If you don't want to download/reference them, use command gen-idea no-classifiers no-sbt-classifiers. libraryDependencies += "com.github.mpeltonen" %% "sbt-idea" % "0.10.0"
Use gen-idea sbt task to create IDEA project files. For now I do this by hand. It is quite simple. That's it from memory. It would be better if it were automated, but it's no big deal as it is now. to your build.sbt to make it copy the dependencies into lib_managed. Tempus fugit and IntelliJ IDEA has become so much better these days. It's 2015 after all, isn't it? Having said that, the latest version of IntelliJ IDEA 14.0.2 supports sbt projects out of the box with the Scala plugin. Just install the plugin and you should be able to open up Scala/sbt projects without much troubles. I'm using the Early Access version of the plugin which is 1.2.67.6.EAP as of the time of the writing. With the plugin just point at a sbt project and IDEA is going to offer you a wizard to open that kind of project. resolvers += "Sonatype snapshots" at "http://oss.sonatype.org/content/repositories/snapshots/"
Run sbt gen-idea to generate IDEA project files. Read the sbt-idea plugin website for more up-to-date information. You may also find my blog entry Importing sbt-based project to IntelliJ IDEA 13 (with sbt-idea, Scala 2.11 and sbt 0.12) useful. See the answer elsewhere on this page. Source: Tackers' suggestion on the message group. You can open an SBT-based project in IDEA nowadays. It will create the necessary project and modules, and keep your dependencies up-to-date whenever you make changes to the build scripts. I just went through all this pain. I spend days trying to get an acceptable environment up and have come to the conclusion that ENSIME, SBT and JRebel are going to be my development environment for some time. Yes, it is going back to Emacs, but ENSIME turns it into a bit or an idea with refactoring, debugging support, navigation, etc. It's not nowhere near as good as Eclipse (Java), but unless the scala plugins work better it's the best we have. Until the Scala development environments get up to snuff (Eclipse or IntelliJ) I'm not going to bother. They're just way too buggy. See the discussion on the lift site. Within that thread, there is a link to a HOWTO for IntelliJ, but although it kinda works, there are many issues that render it a little less that useful. The answers are old for 2014. In IntelliJ 13.x, the plugin Scala is ver 0.41.2 ( SBT is included). You will see two new hidden folders .idea and .idea_modules. Then in IntelliJ, File > Open > select the project. It should open the project without any problem. Before you start creating your SBT project, make sure that the Scala plugin is downloaded and enabled in IntelliJ IDEA. below link explains everything you need to know. Not the answer you're looking for? Browse other questions tagged scala intellij-idea lift sbt or ask your own question. Why doesn't SBT download my own libraryDependencies? What's the proper setup of sbt-idea with sbt 0.11? How do you share your Scala project on Intellj? How to use SBT to create an IDEA plugin project?